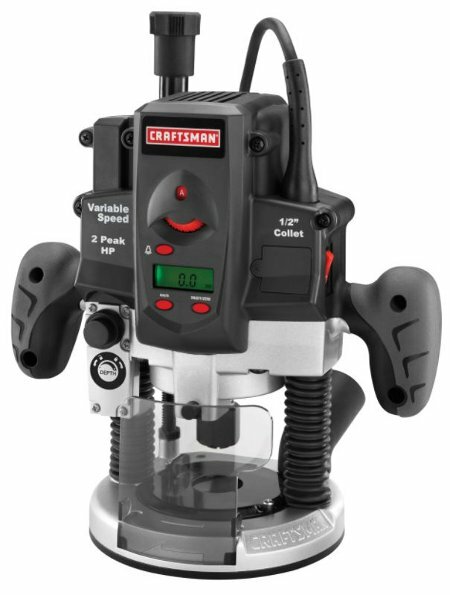 The router uses a variable-speed 10A motor to deliver 2hp to the bit. You adjust the no-load motor speed between 15,000 and 25,000RPM with a dial labeled A though F, so you’ll probably have to look up the letter to speed conversion every time you set it. A dust sleeve surrounds the bit so you can remove the dust with a shop-vac. The router comes with 1/4″ and 1/2″ collets, wrench, dust shield, and vacuum attachment. Pricing starts around $150 before tax and shipping. I see. A digital readout but no laser? I think my only laser equipped tool is my laser level. It seems to be what the people want … but what they don’t realize is it is more to go bad sooner. I’ve always thought it better not to measure if you don’t have to. With our PC plunge routers we typically use setup bars and the turret to set plunge depth. I’ve had this router for a couple of years. It’s got pretty good features and the plunge action is great. I like it as a plunge router better than my Bosch. I hardly ever, and I mean ever, use the digital plunge readout though. Like Fred said, it’s much better/easier to use a set up bar or a piece of scrap to set the plunge depth. This goes on sale regularly for $119 and at that price it’s a decent deal. How many adjusting knobs and buttons does that thing have – 5? 6? That’s a pretty fancy lookin’ espresso machine ya got there, son. I think you don’t really need a digital plunge router. It’s all about instinct when trying to be a handyman. So just feel it and let your instincts guide you! Go get the Makita plunge routers though, because I think it’s the best brand out. But that’s just me. Only a matter of time? Huh? This router came out about 4 years ago, long before many of the gadgety digital tools we see now hit the market. I understand you apparently weren’t aware of it, but don’t act like this is some new router. And knowing Sears, it’s probably been discontinued by now. Stick with reviewing new stuff, guys!